Rusty asked: Man on third, a batter steps out of the box without the umpires permission and the pitcher stops his windup and doesn't throw the ball. Does the man on third score? Rick answered: Rusty, thank you for your question! Rule 6-2 Art 4d: Infractions by pitcher. 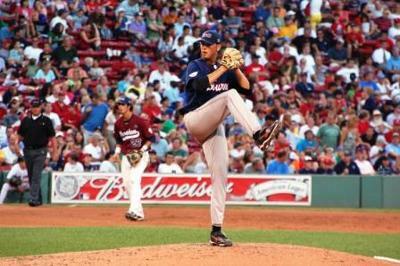 d. failing to pitch to the batter in a continuous motion immediately after any movement of any part of the body such as he habitually uses in his delivery. 1. If the pitcher, with a runner on base, stops or hesitates in his delivery because the batter steps out of the box (a) with one foot (b)with both feet or (c)holds up his hand to request "time", it shall not be a balk. remains live, thus 2 strikes are called on the batter in (b). Rule 3-3 1o- A coach, player or substitute shall not call"time" or use any command or commit any act for the purpose of causing a balk. While the rule about a batter having to keep one foot in the box for the entire at bat has been around a long while now, I find where we are, the umpires do not hold players to the letter of the rule. Umpires have no obligation to grant a hitter "time", even if he asks for it. We tell out hitters to make sure it gets granted before you step out. On the other side, we tell our pitchers that once you have started, finish the pitch, even if it ends up that "time" was granted. It becomes a judgement call on the part of the umpire if a player stepping out was an attempt to cause a balk. In the situation you describe, if the umpire felt there was no intention to try and create a balk, there would be no penalty on either the batter or pitcher. The umpire could call time and start over. If the pitcher actually throws the pitch, it will be a called strike. If the batter has stepped out of the box with both feet, it would be a called strike, plus another strike for having both feet out of the box. The batter can't actually cause a balk. I had the batter balk occur twice in a row during the same inning. Your explanation helped validate my call. Anonymous asked: There is no rule 6-2 article 4D in MLB baseball rules. Please explain where this interpretation is coming from, because i do not see this in the rules. Rick replied: This rule comes from the NFHS (National Federation of High Schools) Baseball Rules, and is located on page 43. The majority of our questions come from Youth Baseball coaches, parents and players, so generally I refer to the Federation Rules for answers, unless they ask specifically about MLB. MLB will have a similar rule, if not identical to this one, as an umpire is not required to give a time out, just because the batter requests it.